I have become enamoured with this species for a number of reasons. In It's range it is the last living tree as you journey to the mountain top. It seems a challenge because I can find very little on it's use as bonsai. I own a dozen of them. They were started by a bonsai enthusiasts 20 years ago after a trip to crater lake Park in oregon, where he collected the seed. the owner's interest in starting a bonsai nursery here in washington state, has waned and i have dug 6 each year during the past two, to begin working on.You'd think in 20 yrs the trees would be taller then 10-12 inches and have a bigger trunk diameter than 1 inch. I would have expected them to bolt at lower elevations. So out of curiosity, I'm wondering who else may have been encouraged to try and work with this tree as bonsai. One of the questions I wanted to ask was when does this tree produce white bark. As you can tell from the photo it is very dark. My limber pines, the other native 5 needle has bark of white. Don't know their age as both yamadori dug. Next year I hope to repot into proper pots and begin some serious work now that they have adjusted to pot life. From the pictures on this interesting page -- http://www.fws.gov/mountain-prairie/species/plants/whitebarkpine/ -- it would appear that the tree would have to have quite a few years behind it before it gets that distinctive bark. The tree has a very limited range (see map on that page) and is being considered for listing as an endangered species. listing, where does that put me as a current owner? YIKES! I could be way off base, but those needles look real similar to my Eastern White Pine (strobus), and they don't quite look like the needles on the link. Again, I'm no expert, but I thought I would throw it out there. You will be fine. The designation will not be retroactive. 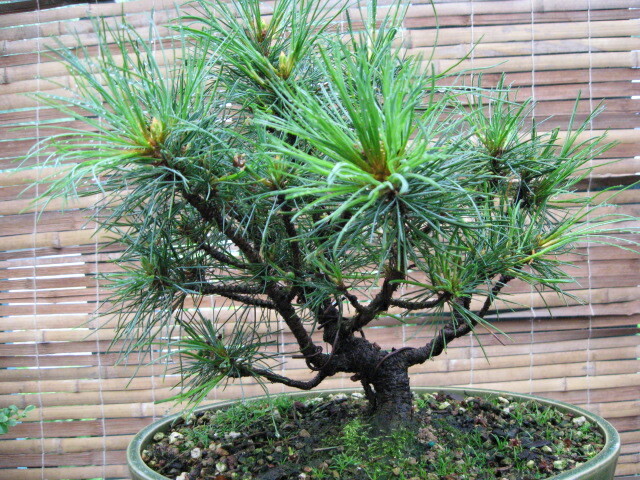 This pine is in the "Stone Pine" group, so perhaps treating it like the Italian stone pine would work -- though I keep reading they're troublesome bonsai.